After face-to-face talks with Russian President Vladimir Putin, Trump contradicted US intelligence agencies and said there had been no reason for Russia to meddle in the vote. Putin reiterated that Russia had never interfered in US affairs. In a strongly-worded statement, US House Speaker Paul Ryan said Trump "must appreciate that Russia is not our ally". "There is no moral equivalence between the United States and Russia, which remains hostile to our most basic values and ideals," he said, adding that there was "no question" Moscow had interfered in the 2016 election. Senior Republican Senator Lindsey Graham, a member of the Senate Armed Services Committee, said Trump had sent the Kremlin a message of US "weakness". He tweeted: "Missed opportunity by President Trump to firmly hold Russia accountable for 2016 meddling and deliver a strong warning regarding future elections." Fellow Republican Senator Jeff Flake - a staunch critic of President Trump - called his words "shameful". In a series of tweets, Senate Democratic leader Chuck Schumer said Trump's actions had "strengthened our adversaries while weakening our defences and those of our allies". President Trump said Putin had been "extremely strong and powerful in his denial" of any election meddling. Before their encounter started Putin was already winning on points, by the mere fact that President Trump was meeting him in the first place. But while Putin came over as the seasoned professional, eager to present his country as an equivalent to the US in terms of being a nuclear superpower; an energy provider; and a key actor in the Middle East, Trump seemed more intent on castigating his opponents back home. A lot of the questions focused on Russia's intrusion into the US election campaign (the considered position of the key US intelligence agencies) and specifically the indictment by the Mueller probe of 12 Russian intelligence agents. Trump would have none of it. He visibly seemed happier with Putin's assurances than he did with the evidence of his own intelligence agencies. And he even welcomed Putin's suggestion that Russia could join the investigation and interview the alleged perpetrators itself! Washington's Nato allies and many seasoned observers on Capitol Hill must have been watching in horror. 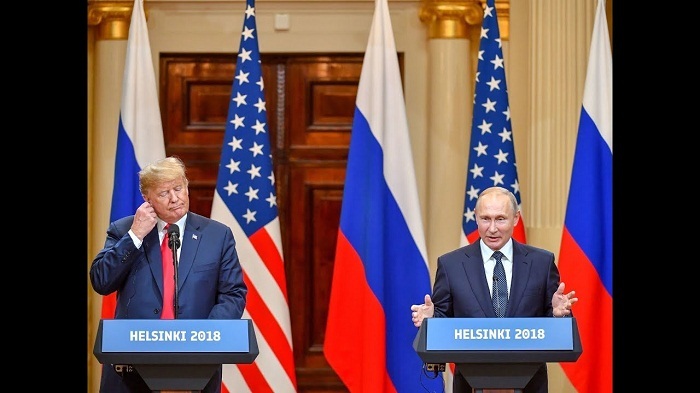 Putin described the Helsinki meeting as "candid and useful" while Trump said there had been "deeply productive dialogue". Trump said US-Russia relations had "never been worse" than before they met, but that had now changed. Relations between Russia and the West were severely strained by Moscow's annexation of Crimea in 2014, which President Putin acknowledged in the news conference. "President Trump's position on Crimea is well known. He talks about the illegality of the Crimean reintegration to Russia. We have another point of view... that a referendum was held in accordance with international law. For us, it's a closed question," he said. "Our militaries have gotten along better than our political leaders for a number of years and we get along in Syria too," Trump said. He added that the US wanted to increase humanitarian aid to the Syrian people.